Hi! I'm Tony and I left a comfortable aerospace engineering job to work full time developing content and products to help you build your space. I am addicted to continuously building my space and I hope I can help you build your space too! Hi and welcome to Shop Hacks! If you consider working in your garage, workshop or hobby room a form of "DIY Therapy" then you may be a Shop Hacker. ​If you are a Shop Hacker then join our Facebook Tribe so you can see other's favorite shop hacks as well as share yours. Its a great place to ask questions or just hang out with likeminded people. I use affiliate links on this site to support more content creation for this site and other Shop Hacks channels. If you have any products that you love to use feel free to send me a note to let me know what the product is and why you like it. I want to always keep the links refreshed with only the latest and greatest products available but I need your help to stay on the leading edge. ​Support ​More Content Through Plans, Products and Merch. This site will help you improve the feel of your workspace with information and tips about improving your storage, organization and efficiency. It will also offer helpful information regarding the latest digital fabrication tools. CNC routers, mills, laser cutters, 3D printers, vinyl cutters, plasma cutters and other digital fabrication machines are amazing tools that can really unleash your creativity but they can be intimidating. This site will take some of the pain out of the learning curve so you can build anything you can imagine with a much less painful learning curve. I spent 18 years developing systems and products for NASA that have flown on the Space Shuttle and are currently on the International Space Station. I left my high-tech aerospace engineering job in 2016 to launch my own product development and engineering consulting company. Since then I've spent every day in my shop using the skills, knowledge and technology that I learned while developing NASA products to develop ways to improve my workflow and efficiency. I have improved all of my tool and materials storage systems, developed simple but effective dust collection and air filtration systems that are cheaper and more effective than most commercial systems. I've upgraded my flooring, walls and lighting to transform my work area from a simple "garage" into a DIY oasis that I love to go to every day. I have learned how to use CNC routers, 3D printers, laser cutters and vinyl cutters to so I can quickly and efficiently develop machines that I've designed for others. Learning to use these new digital fabrication tools involved steep learning curves. The learning curve was very painful and I couldn't find a simple to use resource to take the pain out of learning to use these machines. 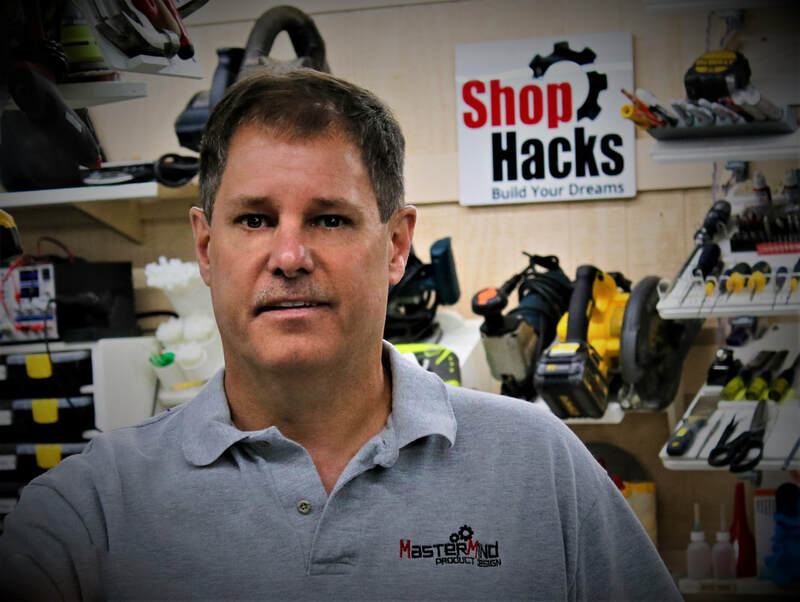 One mission of Shop Hacks is to help you through the digital fabrication learning curves with information to get you going but not so much information that you feel overwhelmed. I love spending every day working here building new products for my clients and for myself. I love how the digital fabrication equipment has unleashed my creativity. I can build just about anything that I can think of now in-hourse without having to pay thousands of dollars to outside shops. I plan to share many of the lessons learned as well as the tools and systems I've developed with you. I will also share my business journey through this website, the Facebook group (Shop Hacks), a weekly blog, as well as YouTube (Shop Hacks), Instagram (shophacksdotcom) and Twitter (shophacksdotcom) channels. I hope to be able to help you build your space as I build mine. I plan to spend a significant amount of time writing blog articles to help build your space. I hope you will consider supporting me and this site by purchasing Shop Hacks plans and products as they become available. I would love to be able to continue to offer building this database of useful information to everyone. I've been helped by many and I hope to be able to continue to pass along the favor.